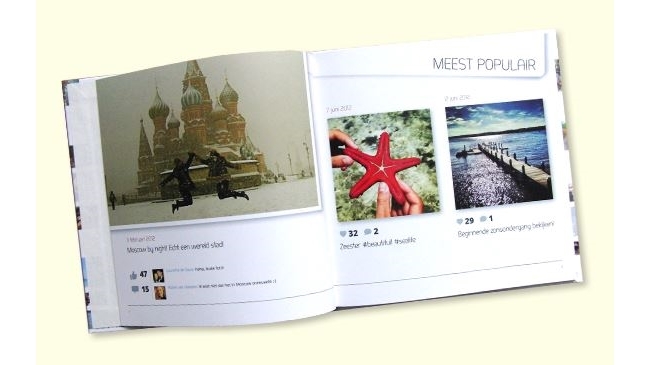 Nijmegen, Netherlands-based ReSnap offered its own take on physical photo albums made up of images from Facebook, Instagram, and Twitter, using its popularity algorithm to automatically select the most popular photos and updates from those social networks for inclusion in the photo books. The algorithm works it magic in one minute, adding features to the photo books such as “golden friend” infographics. Any source of big data can be used as input for our system. Our algorithms are always able to analyze all of these data and transform them into a print-on-demand product within one minute. In the future, you should be able to upload thousands of pictures from all kinds of databases, and we will automatically select the best 50 in one minute. Our system is also already offered as a white-label service so every business can implement our software with just a few lines of code. Social media is just the beginning. We can link any type of database to our system, from cloud-based services like Dropbox to custom databases such as a digital archive of a newspaper. Our algorithms can transform this content into beautiful personalized products within one minute. There are more companies that create photo books, even out of social media, but ReSnap is the only company that selects your most preferred content within one minute. Readers: What do you think of ReSnap’s offering?